RIM’s BlackBerry PlayBook took it’s time getting updated to OS 2.0, months actually. There’s over a million PlayBook sold and this was a big update as it brought native contacts, calendar and email to the tablet. 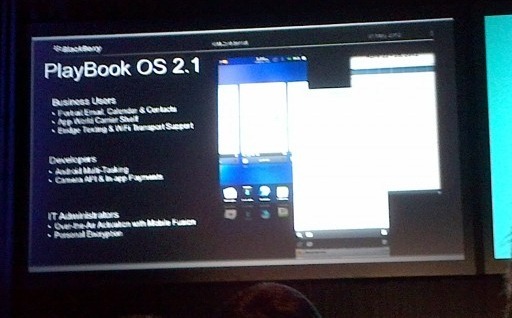 According to Michael Clewley, PlayBook product manager, they’ll push out OS 2.1 into beta within the next couple days. There’s no official word on what OS 2.1 will bring, but this screenshot shows that it’ll give users the ability to view your email, contacts and calendar in portait mode and enlarge the size of text. Hopefully a full change log will be available soon.